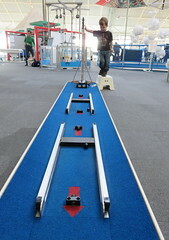 On Thursday I took Isaac to Intech in Winchester. I previously went around 14 years ago when they first opened the current site for an event through work involving encouraging the new generation of kids to take an interest in science and technology, and had been meaning to take Isaac when he was old enough to enjoy the exhibits. The centre is made up of two large floors of interactive exhibits, and although at 3 years old he can’t really appreciate the science behind them, I thought he was old enough to make the most of a day out. I wasn’t wrong as we spent five and a half hours there… and only left because it was closing time! It was reasonably busy, being a cold Winters day in the school holidays, but not so much so that you had to wait more than one turn to have a go at anything. Isaac was particularly fascinated with an exhibit called the Colon Café where you had to use a touch screen to chose some food choices, which produced a ticket you could then scan in various places inside a giant pink “colon” tunnel. 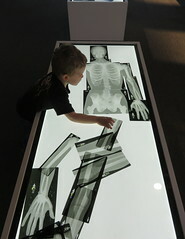 There was also a number of light tables where you could look at x-ray style pictures. There was a large human skeleton which was broken into pieces so you could put it together like a jigsaw – another favourite we had to visit around 6 times! Some of the exhibits were a little dated, and a few not working, plus there was a large section of floor space fenced off downstairs which made it look a bit tatty. Overall though there was plenty of exhibits to entertain. In the centre of the lower floor was a walled, circular soft play area with sofas around the edge – a perfect excuse to chill out for a while safe in the knowledge the little man was enjoying himself and safe! We visited the café for lunch – there was rather a long queue as they only had one working till, but the food was reasonable – Isaac had the kids meal deal of a sandwich, drink and three snack items for £4.95 which is pretty on par with most places. The cost for an adult and child ticket was just about the £20 mark, so coupled with £10 for lunch it wasn’t a cheap day out, but I do think he really enjoyed it, and it saved me a day hanging out in the freezing cold outdoors somewhere! There was a large indoor picnic area too so we could have taken lunch, although I am sure he’d have still dragged me for something else in the café. One thing that was a bit disappointing was the lack of baby changing facilities, given that it is aimed at families. There appeared to be just one upstairs and one downstairs and we ended up with quite a wait. I’d like to go back sometime when he is older and visit the planetarium cinema too, although that costs extra again. This entry was posted on 31 December, 2016 at 8:48 pm and is filed under Days out, Entertainment, Family. You can follow any responses to this entry through the RSS 2.0 feed. You can leave a response, or trackback from your own site.